Cafe DeCamp showcases local, Montana-grown and raised foods. With over thirty Montana farms and ranches in supply the cafe emphasizes support for local economy as well as providing a responsible choice for delicious and tasteful cuisine. Cafe DeCamp offers lunch and dinner Tuesday through Saturday with beer (some of Montana's finest) and wine. Cafe DeCamp suits any budget and palate. It's a wonderful place to entertain out-of-towners or introduce them to Montana cuisine. The Cafe has everything from an incredible lean, grass-fed bison burger with amazing Flathead cherry BBQ sauce, to a variety of crepes. The soups, puff-pastry quiche crust and even the ketchup are made from scratch by Chef Jason Corbridge. 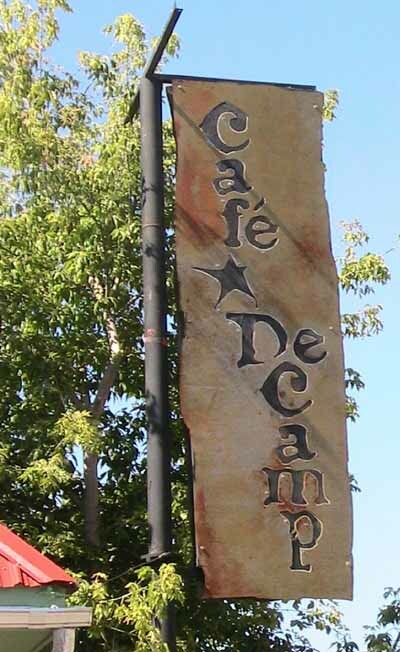 Cafe DeCamp is a quaint family-owned facility under the Rimrocks on Billings north side. There is patio seating as well as a charmingly rustic yet clean interior hand-built by the artist owners. The location is close to the airport, fairgrounds and downtown Billings. See www.CafeDeCamp.com for hours, menu, a list of suppliers and more information. Everyone is welcome here!